Alexander Lacey’s family has raised more than 11 generations of lions and nine generations of tigers – and he is keeping the legacy going. 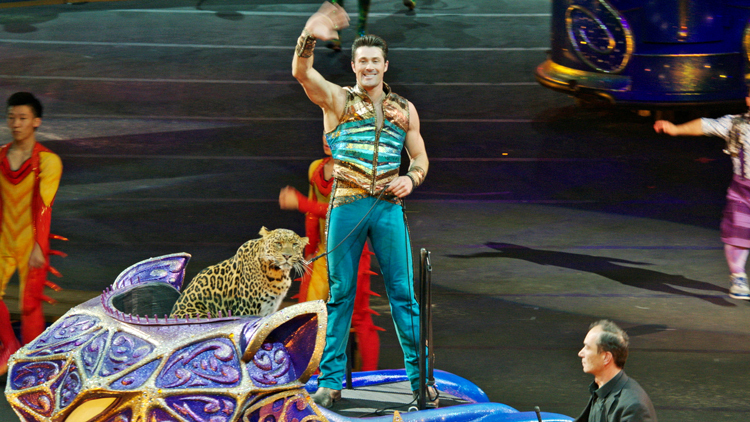 The 38-year-old currently trains, cares for and performs with six lions, 10 tigers and a leopard named Mogli at the Ringling Bros. and Barnum & Bailey circus. Lacey works so closely with his cats that he can tell their mood and temperament based on their body language and behavior. That kind of experience, he says, is what helps to keep him safe. The oldest of three sons, Lacey started learning about – and falling in love with -- big cats from his father Martin, who was a zoo and circus director, and his mother Susan, who traveled the world showing white tigers. At age 11, Alexander left his childhood home in Nottingham, England to attend school in Lincolnshire, where he counted the days until the holidays. 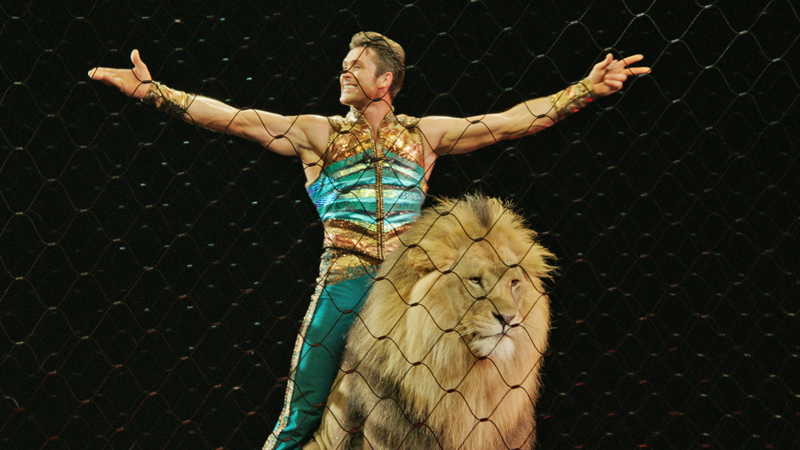 “I couldn’t wait to come home to the circus and help with the animals — especially the big cats,” he said. After graduation, he began his professional career at his father’s circus. A few years later, at age 21, Alexander took his big-cat act on the road. I wake up without my alarm because I can hear the animals waking up. They’re talking to each other and I can clearly hear them outside my RV, which is parked directly behind their arena. My crew arrives and we begin setting up the arena for practice. While the animals are clearly awake and ready to go – my human counterparts and I are still waking up. No time for coffee as we’re already into our morning routine. My crew and I put the cats into the mobile transports that we’ll pull by tractor into the arena. The cats are very familiar with this routine and they know breakfast will be waiting when practice is over, so they’re ready to get started. I begin by working with my leopard, Mogli. I’m practicing having Mogli sit on my shoulders while I walk around the arena. He’s also learning to leap between two pedestals over a bar. Eventually, he’ll jump over two or three tigers. Mogli does well, but he’s not ready to do these things as part of the show yet. I finish with Mogli and want to do a little work with two new tigers Onyx and Tzar. These two are not in the show yet, so I’m just getting them used to being in the arena. I work on some jumps with them and give them bits of meat as rewards. I bring in the rest of the cats one at a time so Onyx and Tzar can get used to being in the ring with all the cats together. They do very well and I send them back into the transports to wait for the end of practice. Then I run through the entire act with the rest of the cats. Whether we have a show or not, I always go through our complete routine as both practice and exercise for the cats. Once we transport all the cats back to the animal compound, we begin making breakfast. Today, they are eating cuts of raw Angus beef on the bone, which we mix with a special vitamin supplement. They will also each get beef heart. I’ll also give the male lions fish oil for their manes. As the animals eat, my crew and I spread fresh wood shavings in the yard areas for each of the cats. After breakfast, the cats are put into their open yards in the animal compound to relax, play and interact with each other. I meet in the production manager’s office for a SKYPE call with someone from our corporate office in Florida, who is filling us in on an announcement Ringling Bros. will be making this morning. One of my responsibilities is giving media interviews and we’re learning all the details of the announcement so we can talk about it to the local media. Which reminds me, I have an interview scheduled for 5:15 with a local TV station. I make a note to find a clean shirt for the interview. I’m still covered in lion and tiger fur and bits of breakfast! I need an industrial size box of those lint rollers. I go back to the animal compound to check on the animals. Most of the cats are lying in the yard relaxing or inside their enclosures sleeping. Lions and tigers are a lot like house cats – they sleep about 20 hours a day. I walk back to my RV to grab some lunch when my phone rings. 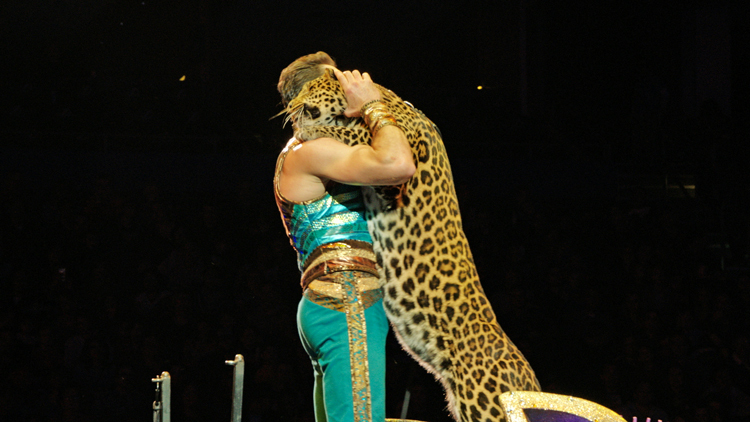 It’s my brother Martin, who works with big cats on a circus in Germany. He’s telling me about a mutual friend who recently visited him and asked to speak to our mom, Susan, who works with me now at Ringling Bros. She helps to take care of the cats. One of my animal crew guys is on vacation this week, so we all have to divide up shifts watching the cats. We always make sure one of us is on duty, but the others are never very far away if we are needed. I spend about a half hour in the animal compound with the cats. They’re always competing for my attention when I’m within sight and several of them nuzzle up to me and “chuff” at me. That’s how they talk to me (and each other). They also communicate with the position of their ears and their tails. One of the crew guys comes back from lunch to relieve me and I can spend a few minutes cleaning up my RV and doing some laundry. I put on a new shirt to meet the local publicist, who has the TV station already in tow. After the camera is set, we start the interview. This is all very routine for my cats who don’t bat an eye. Towards the end of the interview, I place a small bit of meat on the end of a stick and give it to the reporter to offer to one of the cats. 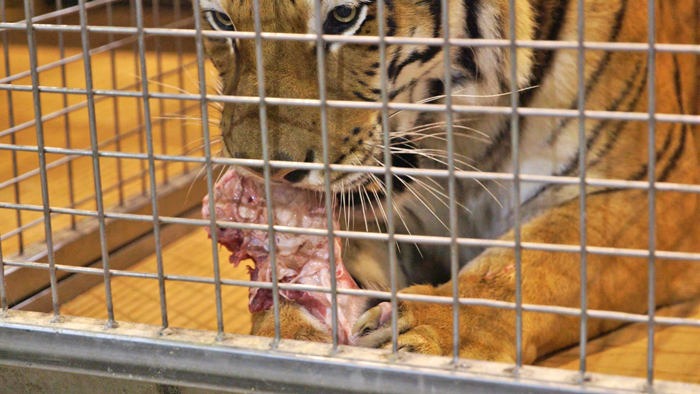 Right on cue, the tiger stretches out to retrieve the meat. I’m told by our production manager that a large crowd of ticketholders has already arrived for our animal open house and that it has started to rain, so they would like to open the doors a few minutes early to get everyone inside. 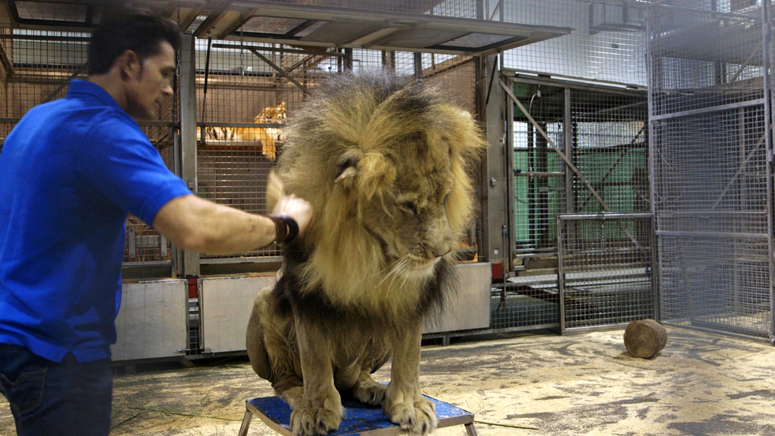 The crowd that has arrived early will get a treat as I usually groom my big, male lion Massai just before show time. Massai is indifferent to the crowds, but he clearly enjoys me brushing his thick mane. Time to get ready for the show! I stop by the RV and grab a quick bite to eat before heading to my dressing room. My costumes for tonight’s show are waiting for me when I arrive. 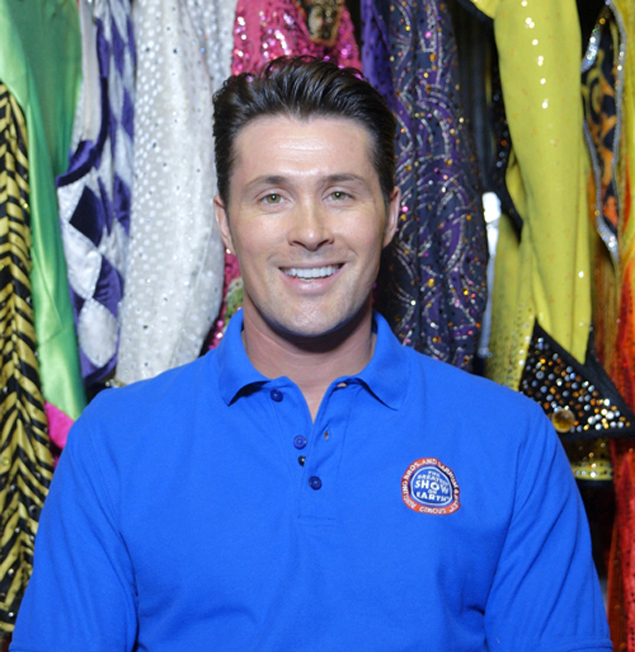 During the pre-show, audience members have a chance to come down to the arena floor an hour before show time where they can try on costumes, learn circus skills, get autographs and even take pictures. My turn on the floor happens at exactly 22 minutes into the pre-show. Our production coordinator always keeps us running on-time. I then make my way back to the dressing room to change costumes before the show begins. I hear the opening music start to play and head out the door to the backstage area. There is a rush of activity. The entire cast is featured in the opening number of the show. I arrive just in time to hop up on my float and make my entrance. I’ve changed into my next costume. 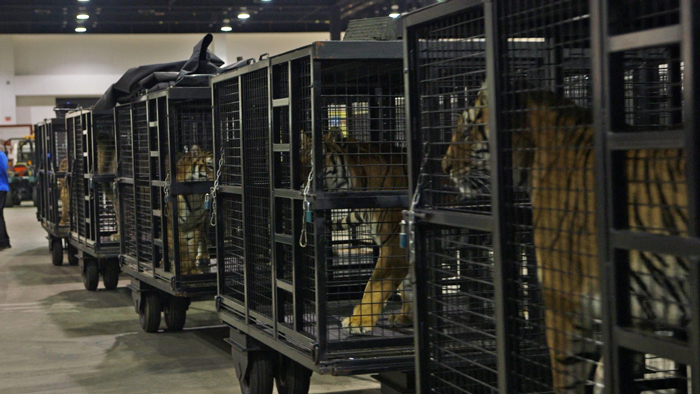 My crew has already gotten all the cats back into the transports to go into the arena for my act. The cats are pacing – they hear the music and know it’s their turn to be in the spotlight. The cage is set up in the middle of the arena in the darkness as the clowns perform on the far end of the arena floor. 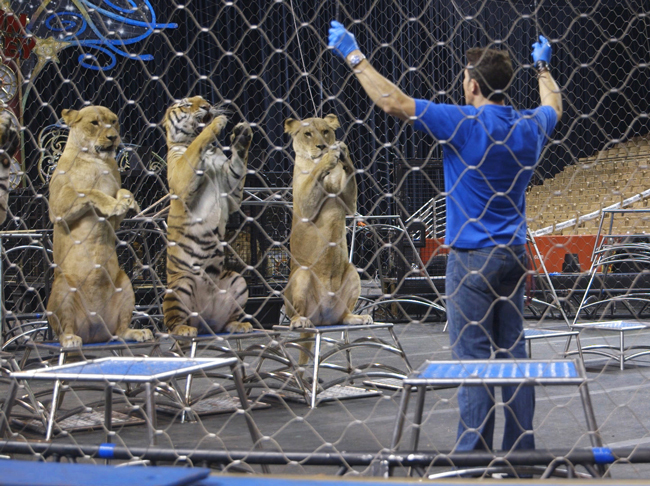 We pull in with the transports and I start bringing the cats into the cage with me one by one and have them sit on pedestals arranged around the ring. The clown act finishes and the ringmaster introduces me. My act is a flurry of activity. It moves quickly, but all the cats are alert and paying attention and performing brilliantly. One of the lionesses, Goldie, starts looking around the crowd and I have to call her name several times to get her attention. We finish up to a terrific round of applause. After transporting the cats back to the animal compound, each get warm milk which they love. I have one more bit in the show where my leopard, Mogli, rides on a float with me. Mogli is trained to be on a short leash and he walks with me to where the float is parked, just a few yards away. One of my crew members walks alongside the float and gives me bits of meat, which Mogli likes to eat as we circle the arena on the float. The float comes to a stop in the center of the arena and Mogli jumps to put his front paws on my shoulders and I give him a hug. Mogli must not feel like he’s getting enough attention from me and during the show tonight nuzzles his nose on my neck and the back of my head. Just as when the show began, there is a rush of activity backstage. After my final appearance in the show finale, I head back to change out of my costume. I head back to the animal compound where I find the cats are stretched out and sleeping. We have three shows tomorrow so we’ll make it an early night. Tomorrow we start it all over again! Readers: What's it like to spend 24 hours in your shoes? Email Nicole.Ridgway@cnn.com for the chance to be profiled in an upcoming story.